City of Tacoma » Government » City Departments and Offices » Equity and Human Rights » Why Equity? The City of Tacoma’s Office of Equity and Human Rights (OEHR) was created in October 2014. The purpose of OEHR is to support the organization as we carry out the goals of the City’s Equity and Empowerment framework, which was also proposed and unanimously adopted by the City Council that year. OEHR consists of a Program and Policy Division and Human Rights office. OEHR is also a member of the Government Alliance on Race and Equity, an organization of approximately a dozen governments that are working to eliminate racial inequities in government. In the 2014 National Community Survey, residents of Tacoma were asked to rank how important it was to expand access to city services and infrastructure to people of different races/ethnicities, disability and income levels over the next two years. Seventy-one percent of respondents said that this work was “essential” or “very important”. More specifically, community members have indicated a strong desire to see “equity and racial justice”, race and social equity analysis of public programs, and support for new immigrants. Combined with direction received from the City Council and the City Manager’s Office, the Office of Equity and Human Rights considers its work to be a mandate. The Equity Index is an online tool, which includes static maps and a report, that helps City officials and community leaders improve quality of life and analyze policies, services and programs with an equity lens. The Index uses data to determine where people are not able to access services or where services do not meet community needs. This enables leaders to better distribute resources and plan funding of programs and services to minimize inequities and maximize opportunities. Tacoma is one of the most racially diverse cities in Washington State: nearly 40 percent of people living in Tacoma are Latino, African American, Asian and Pacific Islander, Multiracial or Native American. However, communities of color in our city experience stark inequities, such as significantly higher rates of unemployment and poverty and poorer health outcomes. 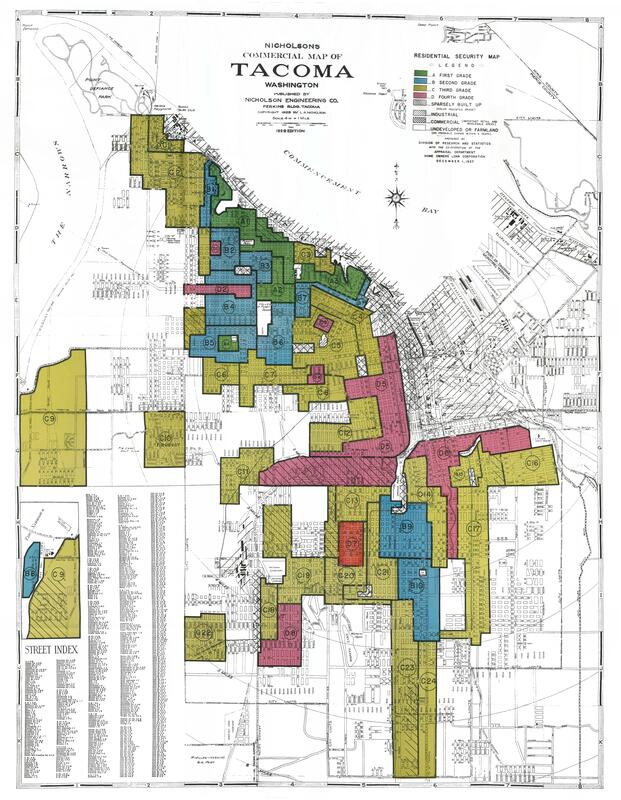 Historically, Tacoma has a documented history of redlining that occurred in the late 1930s, in which more than two-thirds of the city had limited or no access to funds for buying or building a home in areas populated primarily by people of color. View a Tacoma redlined map from 1937. There has also been evidence of the use of racially restrictive covenants in certain neighborhoods, which were used to prevent homeownership by people of color. Read the Narrowmoor Restrictive Covenant. Additionally, our residents of color have reported feeling as if they have fewer opportunities for community engagement and that there is little acceptance for people of diverse backgrounds. Put simply, Tacoma’s communities of color live strikingly different lives than their White neighbors and have far different outcomes. The Office of Equity and Human Rights is committed to uncovering barriers that prevent people from achieving their full potential and creating better outcomes for all. Although the population of Tacoma is diverse, that diversity is not reflected in the City’s workforce. For example, while white people make up roughly 61 percent of the Tacoma population, they represent roughly 80 percent of all City employees (General Government and Tacoma Public Utilities included). Furthermore, women make up 51 percent of the population of Tacoma, but they are only 29 percent of the entire City of Tacoma workforce (General Government (GG) and Tacoma Public Utilities (TPU) included).